In my time as a teacher, I have tried purposefully to connect my students to experts beyond the walls of our classroom. When I began as a teacher in 1991, this was a pretty difficult task compared to today. Contacting local experts in biology or conservation took going out of the way to recruit the efforts of kind, caring professionals who were willing to share their experience with my students and I. Today, it can happen almost accidentally. Today, a few extra steps can flip the equation to a reality where talented individuals can find you. While balancing a myriad of responsibilities in the classroom of today, this shift in reality can be a transformational one… helping to bring relevance and authenticity to the lives of students. Allow me to quickly switch to the issue at hand, and then wrap up my case by the end. Today, I bring you yet another opportunity to assist the education of students in Missouri, from wherever you may be. 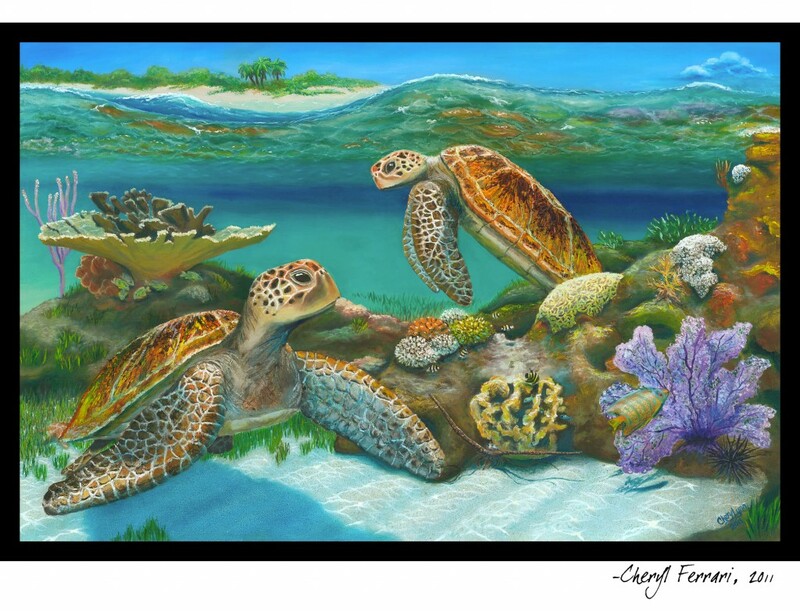 Cutting to the chase, a talented and giving artist from the state of Florida recently contacted my students and I with the offer to contribute an a work of art to help my students pay for the fees of a field study on the coral reefs of Andros Island, in the Bahamas. Cheryl Ferrari is a passionate artist and a giving person. My students and I are quite happy tonight to announce an opportunity for you to own an amazing piece of art while making a donation to hardworking students who are doing extra work on their own time to learn about something they are interested in. On Friday, I will be able to add an actual photo of the actual work. It is an beautiful and massive 36×24 inch print on canvas. Not only was the work donated at an approximate value of from $2000 to $3000… but the framing was donated by a local company. J. Franklin Gallery of St. Joseph donated the $400 framing. Clicking the “buy now” button above will allow you to enter a credit card via PayPal from wherever you may be… to an SJSD account to earn a chance to win the print. This is essentially a donation where 100% of the funds go toward a rich educational experience for my students. We are offering each chance at $5, and three chances for $10. The raffle will take place on the night of March 28th, the eve of our upcoming field study in The Exuma Cays. You see, I take the idea of being a public educator rather literally. In short: whenever and wherever possible, I pull open a window of transparency allowing a peek into the work we are doing. Softening the walls of the classroom in this way has brought us many powerful connections over time. Cheryl Ferrari is a Florida resident who grew up snorkeling and diving on Florida’s coral reefs when they were vibrant and healthy. She no longer dives today, and relies on photographs from those who do as inspiration for her work. Cheryl messaged me via Flickr in April complimenting the work we are doing in chronicling the life (and sadly, death) of coral reefs today. She kindly asked permission to reference our work, and three months later, she messaged again with the image you see above. We could clearly see the elements of the painting that were inspired by photographs we have taken and shared. After more conversation on the details of our program, she offered to donate a limited-edition print to help student offset the costs of the field study portion of the course. And really, though you can’t quite tell it here, this connection has almost left me speechless at times. Since 2000, we have had authors join our discussions of their works. 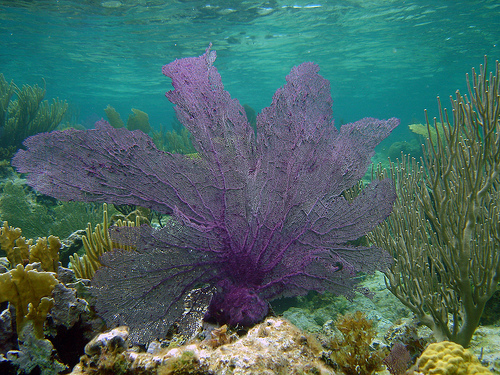 We have had the Center for Biological Diversity request photos for use in a formal federal petition to list two Caribbean corals as threatened, and eligible for protection under the Endangered Species Act. (it worked, by the way) We have had a former student of this program now with a Ph.D. and working on national marine policy, rejoin our community from time to time, as one of our informal teachers. We have had students live blog hurricane landfalls from the gulf, and report back from their work in fisheries from Dutch Harbor, Maine. And on and on. I’m certain I’d leave someone out if I tried to name them all. These connections have transformed our classroom time and time again. It is this sort of real transformation that makes expenditures of modern technology worth the cost. Join us in some way. Take a chance on owning a bit of our story, and thanks so much in advance, from all of my students and I, for donating to such a relevant and authentic cause in the lives of kids. “Massive Sea Fan” is one of ours. See the connection? I’m so happy to be a part of your educational experience and am honored to contribute my work. Wishing you all much success in this venture to financially assist this year’s students.